Enjoy all the benefits of chiropractic care without the fear! Manual adjustments are a safe and effective way of getting your spine adjusted but some people are afraid of getting a manual chiropractic adjustment or are concerned about osteoporosis, osteopenia, or a pre-existing surgery. With the Pro-Adjuster you can put those fears to rest! The Pro-Adjuster is an FDA cleared computerized analysis and adjusting instrument used by chiropractors all over the world. It is safe and effective for children, elderly, disabled and everyone in between. With the use of a hand held device, the doctor gently checks each individual bone in the spine. The adjustment delivered is a light repetitive tapping to restore the proper range of motion to the joints. A second analysis confirms the effectiveness of the adjustment. This space age technology removes subjectivity and guessing by providing the doctor (and patient) with a digital read out of the entire spine. Click here to watch a brief video on the Pro-Adjuster. The Ultralign (same as the Pro-Adjuster) was recently featured on Fox News!! Check it out! 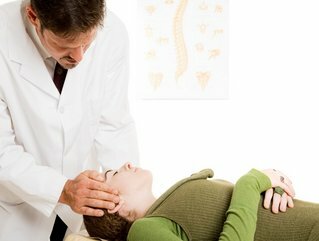 The field of chiropractic care was founded on the premise that adjusting the spine helps the nervous system to work at its best. Over a hundred years ago, when the chiropractic profession was born, few tools existed that could be used to gather objective data to support this hypothesis. This is no longer the case. Evidence that the chiropractic adjustment can positively impact nervous system function can be found in peer-reviewed literature from numerous different fields of research, including neurophysiology, neurology, and biophysics. One such article is Dr. Brian Budgell's "Reflex Effects of Subluxation: The Autonomic Nervous System," which offers a concrete neurophysiological explanation for the clinical observations of chiropractic practitioners (click here for the abstract). In this review, Budgell discusses how localized pertubation of nervous system tissue results in specific biological responses from the tissues controlled by the nervous system tissue stimulated. This article clearly supports the chiropractic assertion that subluxation, which results in noxious input to nervous system tissue (click here for an abstract for a review article that outlines how noxious input may affect the nervous system), can result in body dysfunction and disease. Several recent studies have provided valuable insights into the important question of how a chiropractic adjustment may help to correct nervous system dysfunction. A foundation for this type of work was contributed by Collins and Pfluger, who applied the technique of SSEP, which is a sensitive and specific electrical measure of nervous system function, to measure the effects of a chiropractic adjustment (click here for a link to this paper). The conclusion to this study states that "The removal of the subluxation by chiropractic adjustment results in improved conduction of the neural impulses as demonstrated on the post-adjustment tests. The improvements that were observed are similar to the changes seen when neurological compromise is relieved by surgical procedures to decompress or stabilize the spine." Similar studies have shown significant improvement in a reaction-time task after chiropractic adjustment (click here and here for abstracts) and improvement of sensorimotor integration after chiropractic adjustment (click here for abstract). Each of these studies clearly indicates that chiropractic adjustment results in improvement in nervous system function. Correcting and improving the function of the nervous system has been shown to result in improvement or resolution of many different neurological issues, including Tourette's Syndrome (click here), epilepsy (click here), Parkinson's and multiple sclerosis (click here and here), ataxia (click here), cerebral palsy (click here), and vertigo (click here). It is important to recognize, however, that since it is a global treatment rather than a specific remedy, chiropractic care can help with more than nervous system disorders. The brain, spinal cord, and spinal nerves comprise the nervous system that is the computer and the wiring that monitors and controls the entire body; by helping the nervous system to work better, chiropractic adjustment can help the entire body to work better. If the nervous system is not working at 100%, the body is not working at its full potential. Even a slight decrease in the function of the nervous system can cause a decrease in communication between the brain all of the body's cells, organs, and tissues. A slight decrease in your body's ability to govern and heal itself may not be perceptible on a day to day basis, but over 20 or 30 years, it is sure to take its toll. If you want to make sure that your nervous system is functioning at its optimal level please call or email us to schedule an appointment at Path of Life to have your spine checked. It's always easier to detect and fix a small problem early, than to try to reverse the damage the problem will have caused when your health and your ability to live and enjoy your life are impacted.